This production opened on December 10, 2010 and closed on December 12, 2010. Get Merry! was an all-new, original play written and directed by Liz Goulet Dubois and Bob Hollis. The story was a fast-paced farce that combined a royally intriguing tale with a healthy dose of song, dance and entertainment provided by our fabulous local talent pool. 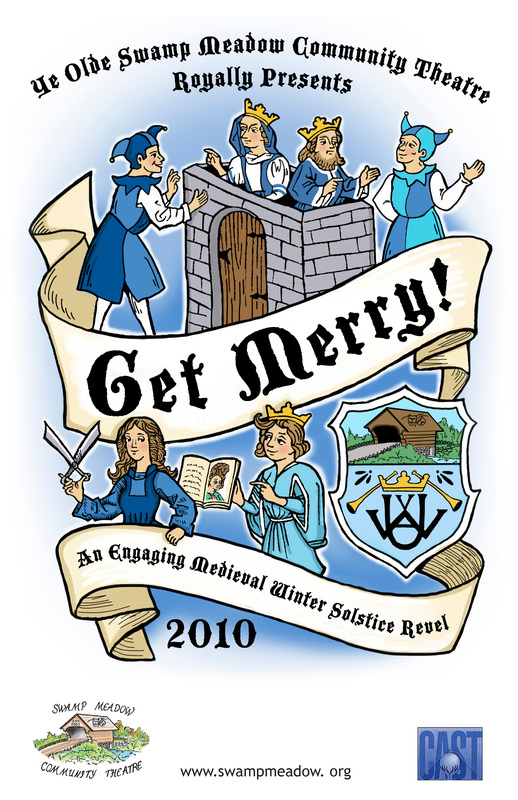 The story concerned Prince Melvin, who is fated to be engaged by the approaching Winter Solstice. The only problem is that he has fallen in love with Merry, the royal Hairdresser, and the Queen is NOT pleased. With the help of a couple of royal Fools, a show is planned that will seal the marriage deal. The course of true love never did run smooth, though, and it’s a wild ride until the end. Will the Prince get his way? Will the Queen ultimately rule? The pun-laden peroration left audiences laughing wanting more of the same… thus development for the sequel began the very next year. The performance dates were Friday, December 10 @ 7pm, Saturday, December 11 @ 7pm, Sunday, December 12 @ 2pm in 2010. The King: Gary Pickard • The Queen: Judy Kerkhoff • Prince Melvin: Zach Gibb • Merry: Mariah Harrington • Cherie: Amy Hollis • Phil the Fool: Tyler Vigeant • Bud the Fool: Jake Wolf-Jensen • The Terrible Trio: Preston Arnold, Andy Affleck, Amelia Votta • The Courtiers: Emily Chretien, Michele Chretien • The Royal Criers: Evelyn Dubois, Brian Wolf-Jensen • The Sisters: Julia Arnold, Audrey Dubois, AnaCapri Mauro • The Washerwoman: Meryn Flynn • The Cobbler’s Daughters: The Cook-Hines Dancers • The Nurse: Lona Robillard • The Knife Thrower: Artie Robillard • The Bakers: Laurie Murphy, Kaila Rubin • The Butcher: Kyle Pickard • Juggling Peasants: Emily Carter, Jake Farnum, Zach Farnum, Millie Dubois• Mimes: Catherine Ellis, Julia Ellis • Sword Fighters: Frank Perrin, Meagan Lalumiere • Special Appearance by The Medieval Victorian Carolers!